Berry Chiropractic > Blog > Chiropractic > Has poor posture got you in a slump? We have all been told that poor posture can be the source of your neck and/ or shoulder pain, but many of us don’t really understand why. When we understand the WHY of something it often helps us in fixing the problem. When we speak of poor posture we are generally referring to a slumped, rounded shoulder and protruding head type of posture. This occurs as a result of muscle weakness and imbalances. This then in turn affects other areas of our spines and other joints, which may too then result in pain. Pain. Nobody wants to be in pain. Nobody wants to live with pain and nobody wants to live with chronic pain that affects a persons overall quality of life. Pain is a way of your body telling you that something is wrong. Something is not functioning or moving correctly or that inflammation may be present. And unfortunately, in overuse type injuries or in the case of poor posture, pain is the last symptom to manifest. So just because you may not have symptoms now, the symptoms may still present if the poor posture is not corrected. Over time, poor posture places abnormal stresses and strains on the joints, muscles and ligaments of the spine. This may lead to anatomical changes (rounded shoulders, forward head carriage, dowergers hump, increased kyphosis etc). The anatomical changes have a direct effect on the integrity and overall functioning of joints, ligaments, muscles and intervertebral discs. This can lead to things such as early degeneration or even degenerative disc disease. The rounded shoulder posture can even affect the way in which we breathe. The tight and shortened pectoralis muscles in front can restrict the thoracic outlet and the bucket handle mechanism in which our thoracic region and rib cage moves during the inspiration and exhilaration process. Over time one will generally feel fatigued and tired as something as simple as breathing is being affected. Improving ones posture is not going to change overnight, and it is going to require some work from your side. But making some small changes is going to make those long work days seem a little bit more bearable. 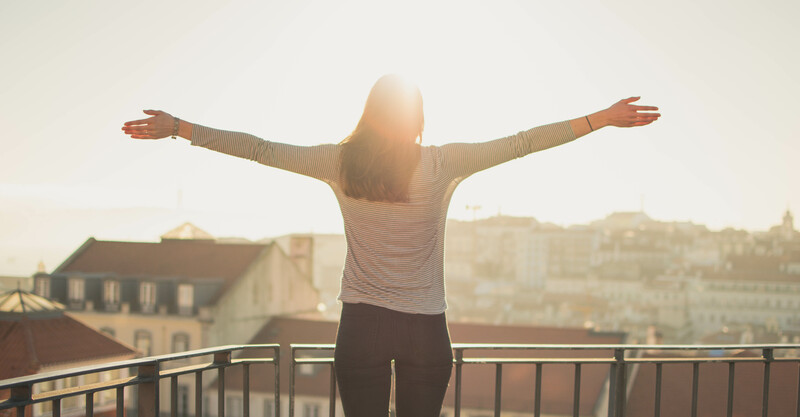 Most of us are stuck sitting behind a desk and computer all day, or some of you may spend most of your time driving all day, either way ensuring that your posture is correct, will save you from a lot of aches and pains in the future. This post will focus on ensuring you’re sitting correctly at your desk or place of work. Assume the correct sitting posture. Sit on your two “bum bones” also known as your ischial tuberosities. Your legs must be able to go under the table. Push your chair far enough forward so that you have to sit upright. You can use a small hand towel or something equivalent to support your lower back against the chair. 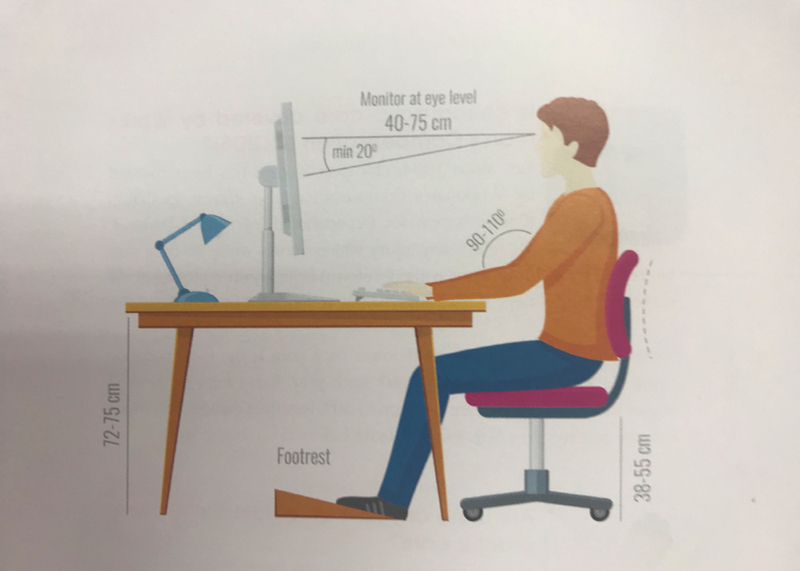 Ensure your computer screen is between 40 to 70 cm away from your eyes. Ensure that you are not looking down and your screen, if you are using a laptop use a laptop stand or books to raise it up. Make sure your neck and shoulders are relaxed and not tensed up. Stand up regularly. It is recommended to stand up once every 30 mins. Standing up not only gets the blood flowing and the muscles moving but one can burn an extra 90 calories a day. Hydrate well with lots of water. Attending a yoga or a Pilates class as these two disciplines help tremendously with core strength and flexibility. See your chiropractor who can assist with posture modification techniques and posture specific exercises.